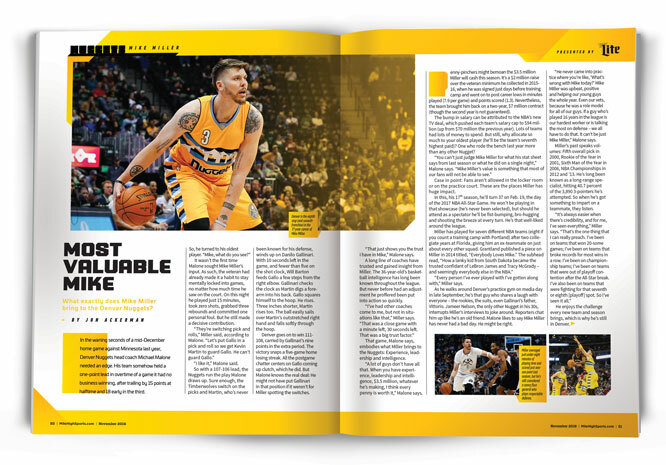 Most Valuable Mike: What exactly does Mike Miller bring to the Nuggets? Most Valuable Mike: What exactly does Mike Miller bring to the Denver Nuggets? In the waning seconds of a mid-December home game against Minnesota last year, Denver Nuggets head coach Michael Malone needed an edge. His team somehow held a one-point lead in overtime of a game it had no business winning, after trailing by 15 points at halftime and 18 early in the third. It wasn’t the first time Malone sought Mike Miller’s input. So the veteran had already made it habit to stay mentally locked into games, no matter how much time he saw on the court. On this night he played just 15 minutes, took zero shots, grabbed three rebounds and committed one personal foul. But he still made a decisive contribution. “I like it,” Malone said. So with a 107-106 lead, the Nuggets run the play Malone draws up. Sure enough, the Timberwolves switch on the picks and Martin, who’s never been known for his defense, winds up on Danilo Gallinari. With 10 seconds left in the game, and fewer than five on the shot clock, Will Barton feeds Gallo a few steps from the right elbow. Gallinari checks the clock as Martin digs a forearm into his back. Gallo squares himself to the hoop. He rises. Three inches shorter, Martin rises too. The ball easily sails over Martin’s outstretched right hand and falls softly through the hoop. Denver goes on to win 111-108, carried by Gallinari’s nine points in the extra period. The victory snaps a five-game home losing streak. All the postgame chatter centers on Gallo coming up clutch, which he did. But Malone knows the real deal: He might not have put Gallinari in that position if it weren’t for Miller spotting the switches. “That just shows you the trust I have in Mike,” Malone says. A long line of coaches have trusted and gained insight from Miller. The 36-year-old’s basketball intelligence has long been known throughout the league. But never before had an adjustment he proffered been put into action so quickly. That game, Malone says, embodies what Miller brings to the Nuggets: Experience, leadership and intelligence. “A lot of guys don’t have all that. When you have experience, leadership and intelligence, $3.5 million, whatever he’s making, I think every penny is worth it,” Malone says. Penny-pinchers might bemoan the $3.5 million Miller will cash this season. It’s a $2 million raise over the veteran minimum he collected in 2015-16, when he was signed just days before training camp and went on to post career lows in minutes played (7.9 per game) and points scored (1.3). Nevertheless, the team brought him back on a two-year, $7 million contract (though the second year is not guaranteed). 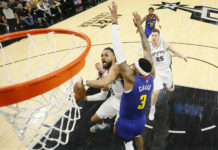 The bump in salary can be attributed to the NBA’s new TV deal, which pushed each team’s salary cap to $94 million (up from $70 million the previous year). Lots of teams had lots of money to spend. But still, why allocate so much to your oldest player (he’ll be the team’s seventh-highest paid)? One who rode the bench last year more than any other Nugget? Case in point: Fans aren’t allowed in the locker room or on the practice court. These are the places Miller has huge impact. In this, his 17th season, he’ll turn 37 on Feb. 19, the day of the 2017 NBA All-Star Game. He won’t be playing in that showcase (he’s never been selected), but should he attend as a spectator, he’ll be fist-bumping, bro-hugging and shooting the breeze at every turn. He’s that well-liked around the league. “Every person I’ve ever played with I’ve gotten along with,” Miller says. As he walks around Denver’s practice gym on media day in late September, he’s that guy who shares a laugh with everyone – the rookies, the suits, even Gallinari’s father, Vittorio. Jameer Nelson, the only other Nugget in his 30s, interrupts Miller’s interviews to joke around. Reporters chat him up like he’s an old friend. Malone likes to say Mike Miller has never had a bad day. He might be right. “He never came into practice where you’re like, ‘What’s wrong with Mike today?’ Mike Miller was upbeat, positive and helping our young guys the whole year. Even our vets, because he was a role model for all of our guys. If a guy who’s played 16 years in the league is our hardest worker or is talking the most on defense – we all have to do that. It can’t be just Mike Miller,” Malone says. Miller’s past speaks volumes: Fifth overall pick in 2000, Rookie of the Year in 2001, Sixth Man of the Year in 2006, NBA championships in 2012 and ’13. He’s long been known as a long-range specialist, hitting 40.7 percent of the 3,890 three-pointers he’s attempted. So when he’s got something to impart on a teammate, they listen. He enjoys the challenge every new team and season brings, which is why he’s still in Denver. “I have a great relationship with Tim Connelly, the GM here. I’ve always had a good relationship with the owners, the Kroenke family. I’ve been able to talk to them a lot,” Miller says. “Obviously one of the things I talked to them about before I signed for two years was their commitment to winning, and they are committed to winning. To me, as you play 17 years, you’re in a lot of locker rooms, you see a lot of things, and culture-building and showing young kids how to win is very important. And the hardest thing to do in this league is win. The word – or abbreviation, really – most often used when praising Miller is IQ. Malone says his 6-foot-8 guard/forward “has a tremendous basketball IQ.” Connelly calls Miller a “high IQ guy.” They both think he’ll transition seamlessly into another basketball role once his playing days conclude. That comes as no surprise considering how the coach and GM are already utilizing Miller. Malone consults Miller mid-game and looks for him to push the rest of the team in practice. Connelly brings Miller on recruiting trips. The Nuggets’ pursuit of Dwyane Wade over the summer was well-publicized. To many, it was shocking that the 12-time All-Star even considered closing out his career in Denver. He ultimately left Miami after 13 years to join his hometown Chicago Bulls. The Nuggets and Bucks were reportedly his other two finalists, and he told Denver it wasn’t an easy choice. Miller was part of the group doing the wowing. He accompanied Connelly, Malone, president Josh Kroenke, and director of pro personnel Jared Jeffries on the trip to New York to meet with Wade and his representatives. Miller and Wade teamed up in Miami for three years and two NBA titles, so it was only logical to bring a player Wade could trust. Though they ultimately lost out on Wade, Miller considers the pitch a positive. “Dwyane Wade being excited about [Denver] just reiterated what I thought because he sent me texts afterwards, ‘Hey, I’m going with Chicago. This is one of the hardest decisions I’ve made.’ That to me is a win for the Denver Nuggets. We are getting closer. 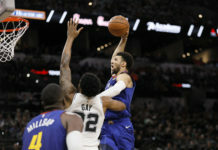 Now it’s our job as players and as an organization to go out there and win enough games to prove that this talent that we say we have, the young talent that we’re quoting that we have, is good enough to bring players like that in,” Miller says. Miller’s other buddy from his Miami days – and a year in Cleveland – was also a free agent this summer. That was much less publicized because no one ever expected LeBron James to actually leave his hometown. Nonetheless, before re-signing, James filled his social media feeds with a few summer escapades on a yacht. It was reportedly the Kroenke family vessel, and the Nuggets’ president was present. Was Kroenke trying to woo James to Denver? Did Miller connect these two? Of course it wasn’t a recruiting pitch. If it were, Miller would have been on that yacht, too. Because that’s another unwritten role Miller fills for the Nuggets – entice players to move to Denver. When told that Connelly called him a “mouthpiece for the organization” on a podcast over the summer, Miller is asked if it’s fair to say the front office is looking to him to help sign free agents. He begins by saying, “I don’t know,” and emphasizes how thankful he is to be a part of the organization. It’s unclear how big a factor Miller was in Wade almost coming to Denver. But he was obviously there to paint as rosy a picture as possible of the Nuggets – and he did this before he even had another contract with Denver. Miller and the Nuggets’ front office met with Wade on July 6. The Nuggets front office didn’t re-sign Miller until July 19. The timing could have had something to do with the execs being preoccupied with NBA Summer League, which ran through July 18. Not that it bothered Miller. He attended some summer games himself. He wanted to see the team’s young players, and meet some of them for the first time. “He didn’t have to do that,” Malone says, “but that’s how Mike operates. When he’s with you, he’s with you and he’s all in.” Even if he’s not technically with your team. With so much talk about Miller’s value off the court, Connelly makes sure to underscore that he’s got game too. At times that may mean inbounding the ball. 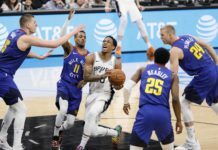 There were critical junctures in games last year when the Nuggets simply needed to get the ball in against an all-out press. Malone often would insert Miller to handle the task. In all, Miller entered 47 games last season. Of the 62 shots he took, 52 were three-pointers, and 19 were made (36.5 percent). His role figures to be similar this season. His conditioning these days consists mostly of body weight training and a lot of stretching. “When I was younger I could go out and jog 10 miles on the streets if I wanted to, or go run stadium [steps]. Now I can’t do that type of stuff because my knees and my back start to hurt. It’s just finding ways to condition yourself without putting that pounding on your body,” he says. He’s in shape with hopes of earning more than the 373 total minutes of court time he received last season. And he might, but he won’t get much more. Malone classifies Miller as a “stretch four.” It’s a position sometimes played by Gallinari, who makes $15 million a year and needs his minutes. Kenneth Faried and his $12 million need minutes there as well. And so does Wilson Chandler, the $11 million man who needs minutes to prove he’s healthy after missing all of last season. So when Miller’s not in the game, he’ll stay locked in mentally from the bench to provide insight for Malone. He’ll teach the young guys in the locker room after games and practices how to overcome the losing culture that’s fallen upon Denver the past three years. If there’s a potential free agent he has a connection with on the opposing team, who knows? He might be asked to show them what Denver has to offer. In other words, Miller will continue being the most versatile member of the Nuggets organization. He’ll keep providing tremendous value, regardless of how visible it is to the public. Outsiders may question why Miller is still in the league making the money he’s making. But the Nuggets won’t.